Welcome to Season 2 of L’oeil Vigilant, a poetry magazine in the form of a surveillance feed for your smartphone. The feed offers a view, in the foreground, of the streetlights just outside our South Bronx editorial offices. The background depicts the Robert F. Wagner Houses of Manhattan and the landing approach to La Guardia airport in Queens. All around, the ambient flow of sunlight, passenger jets, security lighting, and Harlem River Drive traffic are monitored 24/7. Also freight trains bound for the landfills of Pennsylvania loaded with medical waste. The magazine functions in monthly episodes written and designed by artists within the constraints of our surveillance apparatus: an Everfocus Ultra 720+ security camera with low light capability and a 60-160mm manual zoom lens connected to a Swann 43425H DVR. The DVR features SwannView Link security application software with motion detection and sound. Based on each artist’s instructions, we can log into the apparatus and make daily visual and verbal adjustments to the camera, the time code, a moveable text box within the feed, and up to four rectilinear masks. 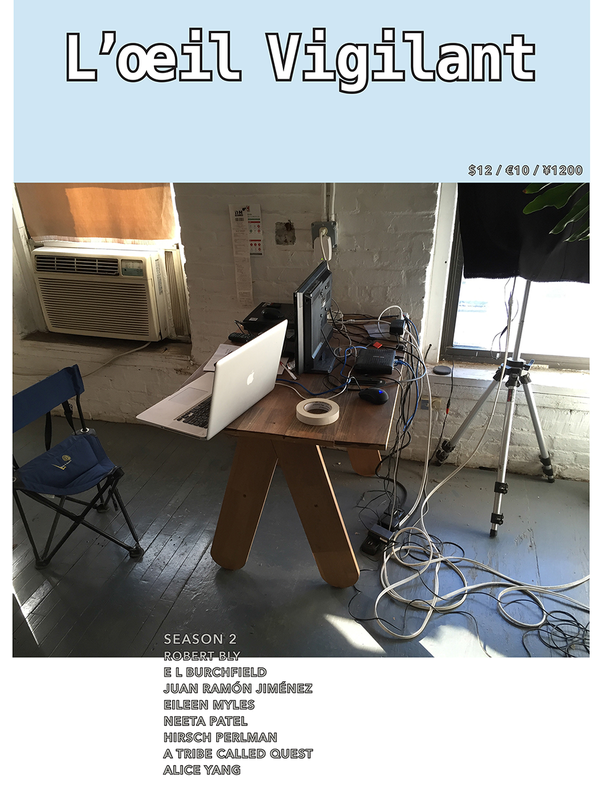 Edited by Joe Scanlan, Season 2 will take a reflexive bent and feature episodes by E L Burchfield, Juan Ramón Jiménez, Eileen Myles, Neeta Patel, Hirsch Perlman, A Tribe Called Quest, and Alice Yang. Marcel Broodthaers died in 1976, just as video was becoming a prevalent high art medium but long before there was a brisk market for consumer-based home surveillance systems. Given developments in his visual aesthetic at the time of his death—exhibitions in Berlin, London, and Paris belied a budding interest in “all over” visual composition—we believe Broodthaers was beginning to sense the cognitive shift of the television age, the disciplined, participatory effect of viewing images on superficial dot matrix screens. It would seem that Broodthaers was becoming aware that we don’t watch such screens so much as surveil them, our eyes pulled across their surfaces in the constant search and assembly of content. There is a similar watchfulness— and distraction—in Broodthaers late work. L’oeil Vigilant is dedicated to that visual and cognitive shift. $12.00 for one year (renewable) available via Paypal, credit card, or check or money order. We love getting checks in the mail. If that is your preferred mode of payment, then make the check payable to Broodthaers Society of America, c/o Joe Scanlan, 520 West 143rd Street #1, New York, NY 10031, USA.